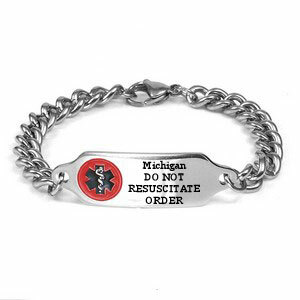 The statutes of Michigan require that your DNR bracelet must contain the message shown on the front of the bracelet. On the back it must have the declarant's Name and Address on the first three lines, followed by the name and phone number of the attending physician, if any, on lines 4 and 5. In Michigan, an individual who is 18 years of age or older, of sound mind, and an adherent of a church or religious denomination whose members depend upon spiritual means through prayer alone for healing may execute a do-not-resuscitate order on his or her own behalf. A patient advocate for that individual who is 18 years of age or older and an adherent of the church or religious denomination may execute a do-not-resuscitate order on behalf of that individual. Thus, there are two different types of Do Not Resuscitate Order forms for Michigan -- one for patients who execute the order after consultation with their doctor, and one for others whose religious affiliation whose members do not seek medical guidance from doctors. We must be provided with a copy of the signed DNR form that was properly executed for the declarant before your order can be released. You can email it to customerservice@stickyj.com or fax it to (727) 490-5446. Please place your order (below), then fax your completed Michigan Do Not Resuscitate Order form to us and let us know your order number. As soon as we receive your paperwork, we’ll process your order and ship your engraved DNR jewelry. Call our toll free number if you have any questions: 866-497-6265.